… and for a cheaper price! Admit it. 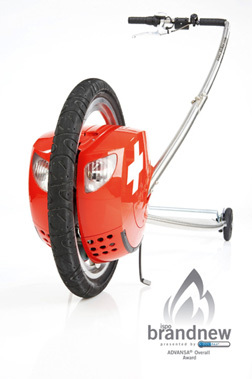 You thought that the Segway was way cool, but the sticker shock simply made it not worth it. Now, the Easy Glider may take the Segway on a run for it’s money. It may sound like something “as seen on TV that promises amazing fitness results,” but this new transportation gizmo has a serious pedigree. Winner of this year’s prestigious ISPO Brand New Award, the main wheel of the Easy Glider is powered by a 360-watt electric motor and will garner a top speed of 13 mph within a 10 to 15 mile range. It also comes with headlights and an optional MP3 player.